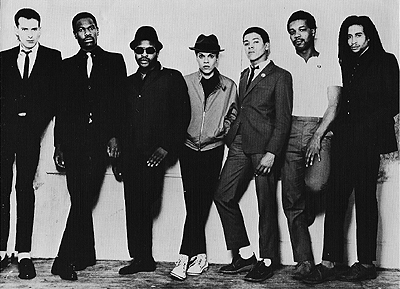 The Selecter are a 2 Tone ska revival band from Coventry, England, formed in mid-1979. 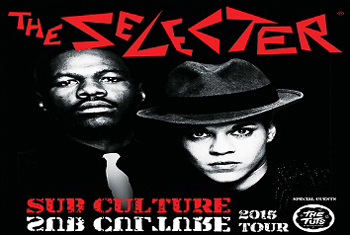 The Selecter featured a racially diverse line-up. Their lyrics featured themes connected to politics. Reinforcing the songs of Neol Davies were the voice and rude girl style of Pauline Black and the rhythms of Desmond Brown on the Hammond organ. Indeed, the band's name is based on the term "selector", which is a Jamaican word for disc jockey. The band were one of the most successful ska bands of the 2 Tone era, notching up several top forty singles in the British charts. The Selecter reformed in 1991 and vocalist Black continued to perform and release music under The Selecter name until 2006. 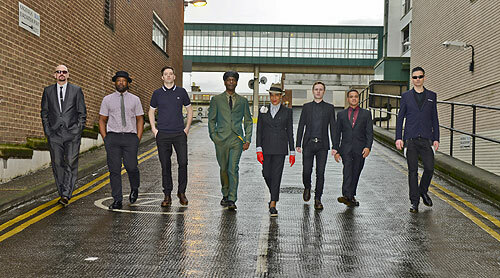 Some confusion emerged over two competing lineups for the Selecter in 2011, between that featuring Davies and that featuring Black and Arthur 'Gaps' Hendrickson, In June 2011 Black applied for, and won, The Selecter trademark and the right to use the name herself. 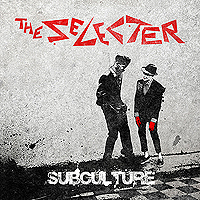 This past June , The Selecter released their brand new studio album Subculture. Mixed by Prince Fatty on DMF Records, it will be released here in the US in October. The Selecter aka Pauline Black and Arthur 'Gaps' Hendrickson will be touring the UK this Autumn and (hopefully) North America in early 2016. I was recently lucky enough to sit down and chat with original member Pauline Black, and taking things from the top, and knowing she had actually trained as a radiographer, and upon completion of her studies, had subsequently worked for the NHS for five years, reflecting back to those days, what were her memories of those five years? "I trained as a radiographer after I dropped out of a ‘Combined Science’ degree in 1973 at Lanchester Polytechnic, Coventry, UK. I did not see myself pushing test tubes for the rest of my life and enjoyed the more hands on, gritty realism of a hospital environment." "The National Health Service [NHS] in Britain is something that I fully support and I consider any country worth its salt should have such a system. If a country cannot take care of its citizens in sickness and in health, what kind of values does it uphold? In my humble opinion the British NHS is something that working people fought for and will be very difficult for our current right wing Conservative government to dismantle, even though that is what they are trying to do." "Based on that premise, I fully believe that if music hadn’t come into my life as a viable working proposition that I would still be a radiographer, but hopefully much further up the food chain than I was when I left the profession in 1979." Stepping into the music scene, you then changed your name. So, when did Belinda Magnus officially become Pauline Black - and why that particular name choice? "Belinda Magnus was my birth name and after my adoption at 18 months old my name was changed to Pauline Vickers. I was adopted by a white, working class family, who typically in the 1950’s, was not racially informed. Therefore I was always referred to as ‘coloured’. Not a moniker that I appreciated. When James Brown sang ‘Say It Loud- I’m Black & I’m Proud’ in 1968, it captured my imagination over here in Britain." "To a fifteen year old growing up in a white suburban town, those words sounded like a clarion call to establish a positive identity for black people. Therefore I decided to refer to myself as ‘black’. Naturally this decision did not sit well with my white adoptive family. Transracial adoption highlights many problems, but the inaccuracy by which my family referred to my racial identity was a big sticking point for me. When I joined The Selecter the opportunity arrived to name myself, so I changed my name by deed poll, at first to a ‘stage name’ and then later I legally became, Pauline Black. The best decision I ever made." Being a founding member of ska band The Selecter, who formed in Coventry in 1979, did you know at the time you had something - or was it too early to tell back then? "Within a few months of working with the band in front of audiences, on a personal level, it became clear that whatever I ‘had’ was something I enjoyed doing and people seemed to like it. Put it this way, I’ve never had to go back to my day job. But most importantly, the band, it’s racial mixture of personnel and enlightened ethos captured that moment in time when there was a shift in racial thinking in the world and it became apparent that multiculturalism was an interesting avenue to pursue." Around the same time you had The Selecter, The Specials, Bad Manners and Madness, all jostling to be the top ska band. What was it like back then, doing "chart battle" with those two monsters of ska, and was everything always, well, pleasant between you all?! "I can’t speak for male rivalry. It has never interested me. I’m not hormonally geared up for such nonsense. The Selecter always had a harder row to hoe. We were 6 blacks and 1 white person in a band. That was very different from the racial makeups of the other two bands, who numbered 2 blacks among 14 white persons in total and both of those black musicians were in The Specials." "Back in those days, some of the racist skinheads who followed the music referred to The Selecter as ‘The Selecter +6’, and The Specials as, ‘The Specials +2’. So go figure. Madness did not have to put up with such derogatory epithets and tailored their music more obviously to the pop charts. But they were a great band and we were fighting the institutionalised racism of the establishment at the time, so sometimes the jostling for position was not completely predicated on ‘chart position’." 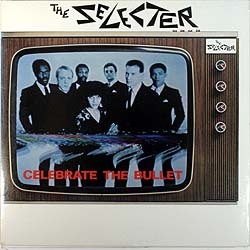 The Selecter was named after the Jamaican word for disc jockey (which I never personally knew), what other band names were floating around at the time and could so easily have been chosen instead? "The only name I know of was ‘Stryder’." Being that you got credited with jointly starting the "ska revival movement" along with both The Specials and Madness, in reflection would you have done anything differently in those early days, perhaps? "I think we should have chosen our record producers more carefully." Rolling Stone Magazine once said of you that, "Hands down, Pauline Black possessed the best voice that ever graced a 2-Tone release." High praise indeed, but if you yourself don't agree with that statement, who would you put up there as a major contender to that crown? "I’m quite happy with that particular ‘crown’. If someone wants to come fight me for it, then bring it on. May the best woman win! Please note, that my tongue is firmly in my cheek while writing this answer." The brilliant Too Much Pressure was released on my birthday (Feb 23rd) back in 1980 and was a HUGE hit - and rightfully so. Containing five cover versions, how much input did you have at the time with regard the songs written and the songs finally chosen? "I actually contributed 2 songs, 'They Make Me Mad' and 'Black & Blue'. I was happy with my contribution." When you listen to those songs now, what do you hear - what usually comes to mind (good or bad) about the recording of the album, in general? "After 36 years it would seem nit-picking to start criticizing a debut piece of work which so many fans around the world love and enjoy listening to. I thank them for their continued appreciation and I hope with our most recent album Subculture that whatever niggles I might have had about the recording process back then, have now been completely ironed out." As for the cover art, of Steve Eaton leaning against the wall, were you there that day the album art was being shot? And what were your thoughts at the time (and now) on the finished work? "No, I was not present at the photo shoot. Steve ‘Cardboard’ Eaton unfortunately passed away about three years ago and is sadly missed around Coventry. He was an absolute doyenne of ‘rudeness’ and probably the most stylish guy in Coventry city." 1) 'Gangsters vs. The Selecter' (UK #6) - "Well, 'The Selecter' was actually an instrumental track recorded by Neol Davies & John ‘Brad’ Bradbury of The Specials in 1977 and produced by Roger Lomas. Neol Davies tried to get a deal with it, but to no avail and when Jerry Dammers ran out of enough money to record a b side for their Gangsters single, The Selecter instrumental was resurrected as a B side. 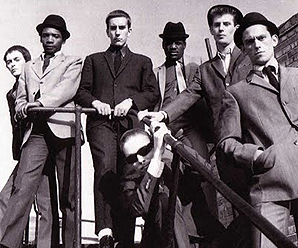 When the Specials single began climbing the charts, it became imperative to form a band. That’s where I came in, along with 5 members of a local Coventry reggae band ‘Hardtop 22’. Thus The Selecter as a band sprung fully formed into the music business and within 6 months had their own chart success with 'On My Radio'." 'On My Radio' (UK #8) - "Via the 2-tone label, Jerry Dammers of The Specials advanced The Selecter £1000 to record 2 tracks for a single. We ended up recording 3 tracks, 'Too Much Pressure', 'Street Feeling' and 'On My Radio'. 'On My Radio' was the obvious choice for a single and went Top 10 while we were on the 2-tone tour." 'Three Minute Hero' (UK #16) - "In those days, pop singles were a prescribed length of 3 minutes. Any longer, the wretched DJ’s talked over the end of the records. So we liked to be sticklers for accuracy. It also represented the ‘impossible dream’ for working class kids at that time - a 3 minute hero was the pop star with a 7 inch vinyl record with their name on it." Your follow up album was Celebrate the Bullet (1981) and knowing several band members left just after its release, do you put the fact it wasn't as much of a commercial success as Too Much Pressure wholly down to an unstable working atmosphere, perhaps? "2 band members left before Celebrate The Bullet was ever recorded. Desmond Brown and Charley Anderson jumped ship in the summer of 1980 after the recording of our 5th hit single ‘The Whisper’. They formed an ill-considered and short-lived band together The People, that released one record which did not chart. Divisions were appearing in the band even before the Too Much Pressure album was recorded." "Celebrate The Bullet was in my opinion, musically a much better album than Too Much Pressure, but unfortunately the release coincided with the gun murder of John Lennon and the attempted assassination of President Ronald Reagan. UK Radio did not want to play the title single and without radio-play, no record gets a particularly fair hearing. 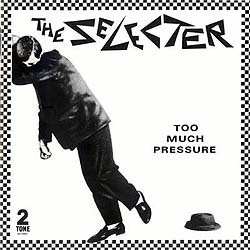 Given the fullness of time, I think that many present day Selecter fans see that piece of work as a much fuller representation of The Selecter than Too Much Pressure. Celebrate The Bullet remains a highlight for me in the Selecter canon. I can’t think of a better song that has been written about the futility of gun violence than that." The original Selecter split up back in 1982, and as much as they have sporadically reformed since 1994, have been solid since 2011, and even have a new album out today, what did finally break the band up back in 1982? "In 1982 - Stupidity. We don’t deal with such ‘stupidness’ any more." These days, The Selecter are both yourself and original vocalist, Arthur 'Gaps' Hendrickson front and center and the just-released brand new album is Subculture. So, what were some of the first major differences you encountered in recording and making this album from, say, Too Much Pressure back in 1982? "We have entered the digital age, so first and foremost it was much easier than dealing with analogue studios with large 24 track 2inch tape recording machines. It’s also easier to share music files with each other and ruminate on what has been laid down in the recording studio in the solitude of your own home. This space to think, allows for experimentation and improvement without the studio clock ticking enthusiastically past every expensive hour." "But largely the creative recording process remains the same and starts with the 64 thousand dollar question: ‘Is the song any good’? If the lyric and melody are no good, it doesn’t matter what expensive production values you bring to it, the song is still a turkey. At the risk of mixing metaphors, that old adage of ‘putting lipstick on a pig’ always holds true, especially in a studio." "So we all put a lot of time and effort into working on lyrics and melodies before we start on the arrangement. Lyric and melody automatically dictate the ‘feel’ of a track, but not always the arrangement. Therefore it’s good to have an extra especially ‘tuned’ pair of ears objectively listening to the track and that person is the kingpin - the producer. We have a fine producer in Neil Pyzer, who also plays tenor sax with the band too. Formerly with 80’s band ‘Spear Of Destiny’, we have recorded all Selecter material with him since 2011 and it has proved a very fruitful partnership and has now been rewarded with a chart album in the UK, something that had eluded The Selecter for 3 decades!" "Subculture feels like a fine piece of work, which we are all very proud of. It mixes the best of the old, with the ideas and creative writing of the new. And to top it all off we had it mixed by Prince Fatty, whose mixing plaudits include Lily Allen, Hollie Cook & Gregory Isaacs. We are all very proud of the fantastic reviews that we have garnered over the past few months from magazines, blogs and radio alike." When it came to writing the songs for this album, your lyrically political beliefs and awareness still seem to be flying strongly and proudly. But what was it, back in the day, that first caught your attention with regard politics and had you seemingly hooked thereafter? "Racism - pure and simple. It is unfair and unjust, socially and economically. Obviously over the ensuing years my political beliefs have become more sophisticated, but the bottom line for me is embracing a multicultural, secular society. It is the only sane way forward for a civilized world, whatever your personal beliefs." It seems to me that this album was brought to people's attention more through social media than ever before. Did you purposefully use social media to get knowledge of this album out this time, or was this all done by your publicity company, perhaps? "A bit of both, but obviously we use all social media at our disposal. It pays to keep up with new technology and coupled with word of mouth it would appear to be a winning formula for getting the band known and letting audiences know what the band is doing from moment to moment. Even so, much hard work and gigging has primarily gone into our present spate of success." "I always figured that if Barack Obama can become president of the USA, then anything is possible;-) Never thought that was going to happen in my lifetime." 1)	'Box Fresh' - "The first song written for the album does exactly what the title suggests." 2) 'Open Goal' - "This song is about relationships and the subtle forms for domestic abuse that happen between couples." 3) 'See Them A Come' - "This is a cover and dovetails nicely with the harder hitting sentiments of 'Breakdown'." Taking a look at the front cover art, please tell us more about the one chosen, why it was chosen, and how it relates to the album title, Subculture? "The artwork looks like a piece of Banksy graffiti, who we are great admirers of. Our guitarist Will Crewdson took an iphone photo of me and Gaps being photographed against a white wall. The original photo has the other shoot photographer in it. Will’s photo looked as though the photographer was taking a picture of a piece of Banksy graffiti, but it was real. It just goes to show that some great ideas are purely accident." Subculture comes out here in North America in October, so have you got plans to tour here in support of it? "We are currently in discussions to come out sometime next year in 2016. We love the USA audiences and can’t wait to capitalize on the success of our brief tours in 2013, the highlight of which was obviously ‘Coachella’." You've gone on to do a lot of acting work, so what is still to this day, your proudest moment on TV or in film? "Playing Billie Holiday on stage in London in a play called ‘All Or Nothing At All’ by the critically acclaimed writer Caryl Phillips and then collecting a Time Out/01 for London award from John Malkovitch at an awards ceremony." You've written your own autobiography, Black By Design (2011), so what's next for you in the literary world? And will The Last Supper ever get released, perhaps?! "Yes, my memoir, Black By Design was published by Serpent’s Tail and another chapter brought it up to date for the 2nd edition that was published in 2012. I’m still trying to find a publisher for current novel ‘The Last Supper’." Finally, we here at Exclusive Magazine LOVE penguins! So, we would like to know if you do too?! "Of course I love penguins. They are the ultimate 2-tone bird, black and white with ‘happy feet’. That’s just how we love our audiences!!!!"